If you’ve enjoyed that luscious dessert - crepes Suzette, (see here), how about a less flamboyant but more “filling” crepe dish that is beloved in many eastern European cultures for its deliciousness? I’m talking about blintzes. Similar to the Polish nalesniki, Russian blini or German pfannkuchen, blintzes are a precious, aromatic dish that makes for a good breakfast, brunch or almost- anytime snack. Sometimes in the wintertime when we were schoolchildren, my mom served us some blintzes when we got home from school and we devoured them gleefully in the warm kitchen. After you make crepes once or twice, it will become second nature to you. The most important caveat is to let the batter rest in your icebox before you make the crepes. Put all in a bowl and beat until very smooth or in an electric blender and blend well. Chill for 30-60 minutes. The batter should be like heavy cream, if too thick add water to adjust it. Various toppings go well with these blintzes. Sour cream and a little sugar is a most basic topping. Toppings I like are cherry or blueberry sauce. They go well on many desserts, i.e. French toast, pound cake and many others. Combine sugar and cornstarch in a saucepan and mix. Have yourself some cheese blintzes, these groceries will make you happy. You will really love the taste and texture of blintzes and they are, if you follow these steps, fail-proof to make. Love, love, love Cheese Blintzes... but they are not on my alkaline diet. Maybe one day I will enjoy them again. Oh yum, I used to make crepes in high school. Tonight I'm making blintzes. Thanks Al! I am loving these. The Method is similar to dosa what we prepare here but ingrdients are totally different. I have added in my to-do list. So delicious sounding! I am about to have my dinner and now I am ravenous! Thank you for this lovely recipe. MY JOURNEY WITH CANDIDA: Oy, you're right, cheese is acid, but at least the butter is neutral eh? I hope you could at least have a small blintz once in awhile. GENE POOL DIVA: Good for you Gene, you are in for a treat. UMA: Hi, I've never made Dosas yet. 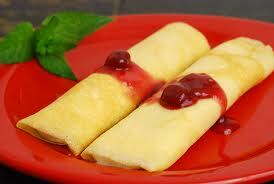 These blintzes are really good, I know you will love them. JEAN: You're quite welcome Jean, blintzes are delicious. The contrast of cheeses and blueberries makes this recipe sound both mouthwatering and appealing to the eye. Breakfast was never more inviting! These look lovely. Perfect for breakfast or any meal of the day. KALYANI'S PLATTER: It definately is. TORVIEWTORONTO: These are great crepes. GAIL M BAUGNIET: You certainly have described it perfectly. WORDS OF DELICIOUSNESS: You are entirely correct, I hope that you will try them soon. This recipe sounds yummy. Thanks for sharing it. Oh, how fabulous!!! I grew up eating crepes and prefer them to traditional American pancakes. Your blintzes look perfect! MISHA: Frying only the one side keeps the crepes more pliable, when filled they are then browned all over. I don't know much about South Africa. PURABI NAHA: Thank You for your kind words, I am grateful. SUSANNE DRAZIC: You're most welcome. LIZZY DO: They are perfectly tasty. THE GOLDEN EAGLE: They are that, Thanks for calling. MIRIAM: I agree with you. I can't believe they aren't more popular. JOYCE: Well, you are halfway there. You could cook the crepes and wrap and refrigerate them for later. Same thing with the filling and sauce if you want to. Then the actual preparation is a pice of cake, I mean is exceedingly easy. I love blinzes, we make them with cheese and raisins. Such a nice dessert. Lovely presentation. Thanks for sharing and thank you for the nice comment on my blog. ANITA - RECIPE WITH PICTURES: Raisins good in blintzes yeah. Thanks. DEEPS@NAUGHTY CURRY: Blintzes are a lovely breakfast, I'm happy that you like them.